In a variation of my Christmas gift bags, I realized that by layering stencils I could use multiple colors. (I don’t know why this wasn’t obvious to me from the start, but it wasn’t.) I was meeting up with a group of good friends I know from Twitter and had such an urge to make them something, but it had to be fairly inexpensive yet worth giving. 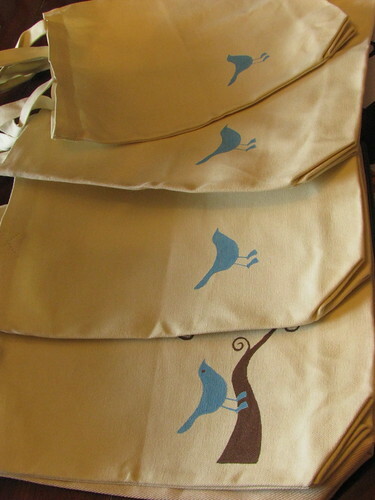 For each of these I used one canvas bag, two colors of fabric paint (turquoise and brown) and three pieces of cardstock. 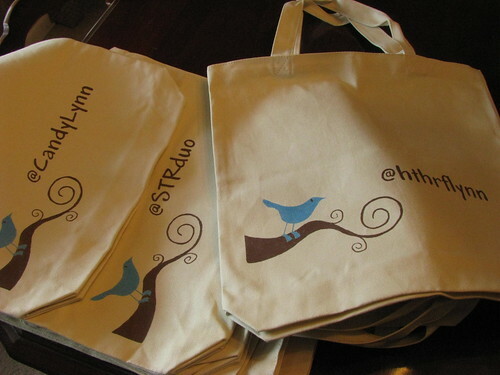 I used three cardstock stencils on each of the bags. I snagged the Twitter logo and printed it twice on card stock. 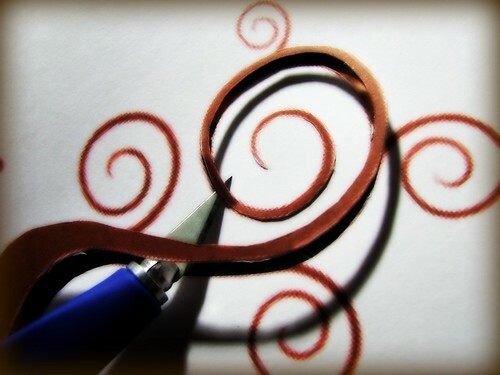 (It should be noted that selling someone’s logo without permission is a no-no, but making a small batch of gifts is OK.) On one copy of the Twitter cardstock use an exacto knife to cut out the main part of the branch. On the other, cut out the bird. Careful with those tiny feet and legs! You could stop there if you like and have a very cute bag, but I also printed out each person’s Twitter name and cut it out, too. There’s just nothing like knowing a gift was made just for you! It’s best to paint the bird first, allow him to dry, then layer the branch stencil over the top of his little feet so that he’s properly on the branch. It’s easier to do a quick outline of the branch before removing the stencil and filling in. Freehand the smaller branches as they’re just too tiny to bother with a stencil. I kept the cut out section of bird and used him as a stencil for the eye, but if you’re good with a brush you could freehand that as well. Then line up your friend’s name stencil and carefully fill it in. If your fabric paint calls for ironing to set the paint, please do. You are talented! Nice idea. Sarah Girl you truly are a creative inspiration to me and many others and for this I thank you. Keep it up! Thanks so much to all of you! These were a little time consuming, but lots of fun to make. I had no idea it was that detailed and took so much time! That’s amazing! You are so sweet (as we already knew!)! Thanks, Jennifer! They hold up pretty well, too – I’m glad!